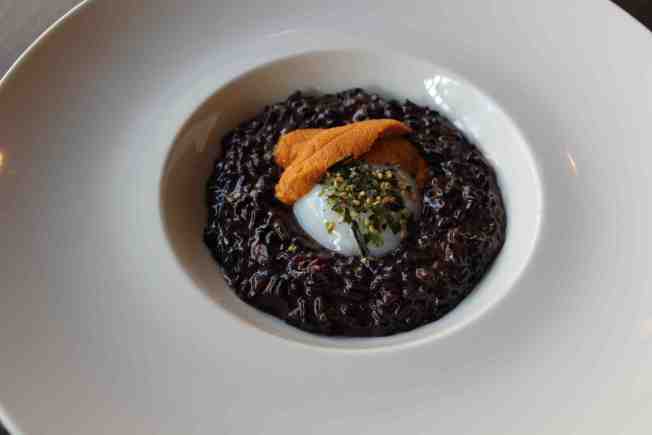 Prospect's black risotto with uni sports the Giants' team colors. It's no secret that Giants fever is everywhere right now, but there are also some hidden treasures inspired by our winning team. San Francisco's Prospect Restaurant on Spear Street currently offers a special of black risotto flavored with uni (sea urchin), which is orange, in honor of the Giants. Chef Pam Mazzola was specifically inspired by Barry Zito's recent performance in Game 5, but has decided to serve this dish for as long as she can still get fresh uni — and as long as the team keeps up its winning streak. The risotto is not mentioned on the menu at Prospect, so you'll have to ask for it specifically for a creative way to celebrate and toast the team's success.